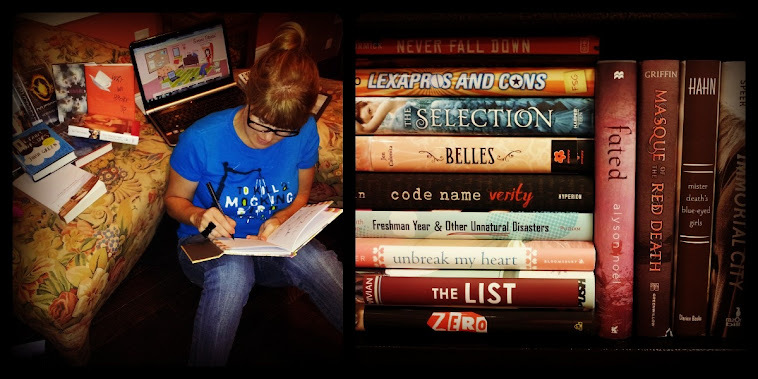 I am seriously behind on my reading and blame two things – 1) the impending start of school with its back-to-school library displays and teacher in-services I’m responsible for, and 2) the Olympics. I have been a mayjuh Summer Olympics junkie, as much for the sports as the host city of London (love me some Royals! ), and it’s oh-so-much easier to multi-task by creating poster displays whilst cheering on the Fab Five or drooling over Ryan Lochte than it is to try and follow the plot of a book with those diversions. Olympics, I really need for you to be over soon, so I can get my life back long enough to hand it over to my school for the next nine months. Vampires, werewolves, mermaids, fairies, demons, zombies, draki…the paranormal market is flooded with supernatural beings of all kinds, but none are as big at the moment as angels. 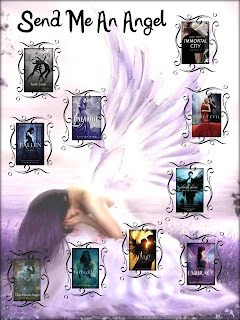 Three of the most popular angel series also have books coming out in the next couple of months – Alexandra Adornetto’s Heaven (Halo Series), Jessica Shirvington’s Entice (Embrace series), and the one my students are most excited for, Becca Fitzpatrick’s Finale (Hush, Hush series). 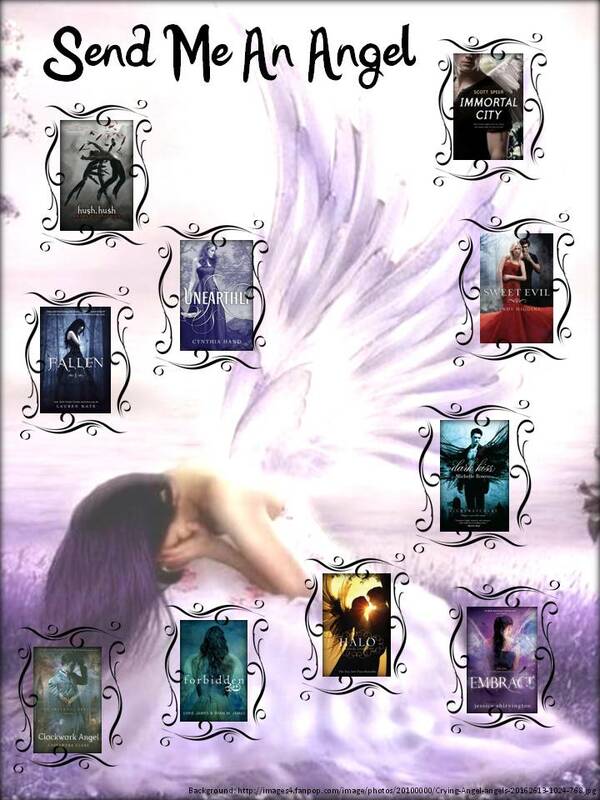 I’ve found students who are into one of the following series typically go on to read the other series once I direct them to the books, so what better way to make my job and their search easier than to create a poster featuring a few of the angelic selections out there? Christian Grey may be all-the-rage with the twenty-something and up crowd, but ask my girls who the hottest guy is in fiction, and they’ll tell you it’s fallen angel turned guardian angel, Patch Cipriano. I witnessed a Patch vs. Peeta fangirls smackdown in my library before summer break – the fandom is that serious. They cannot get enough! Unfortunately, Finale is set to be the, well, finale to the series when it’s released this October. Los Angeles, the city of angels…no, literally. Angels are the newest celebs, and Jackson Godspeed is the Channing Tatum of them all. He could have anyone he wants but falls hard for regular girl Maddie…and that’s when things get really interesting. Funny and romantic. It’s fallen angels versus humans in Shirvington’s series, already a hit in Australia. Violet prepares to fight on the side of the protectors of the humans, but when her trainer betrays her and a fallen angel saves her, she can’t decide who to trust…and love. A prequel to her Mortal Instruments series, we see how the Shadowhunters got their start. Not angels, per se, but they do fight demons and Clare packs her books with lots of action and supernatural characters from all walks of life (demons, vampires, faeries..). Guys are as into these two series as the girls – or at least they are at my school. Anna is the child of an angel AND a demon – so which part of her will win when she crosses paths with bad boy Kaidan? Bishop is sent from Heaven to earth to complete a very important task…and then he meets Samantha, who’s just experienced her first kiss, a kiss that forever changes her and sidetracks Bishop from his work.